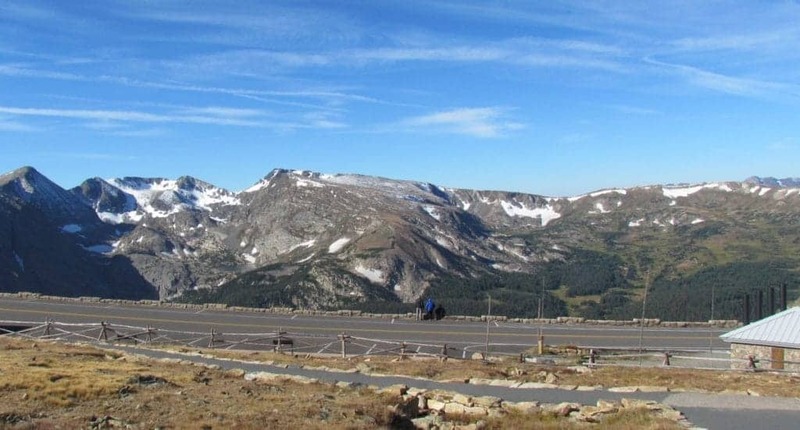 Trail Ridge Road is the name of the heavily traveled highway that passes through Rocky Mountain National Park. Aptly nicknamed “Highway to the Sky”, this oversized two lane road covers 48 miles between Estes Park and Grand Lake in Colorado. 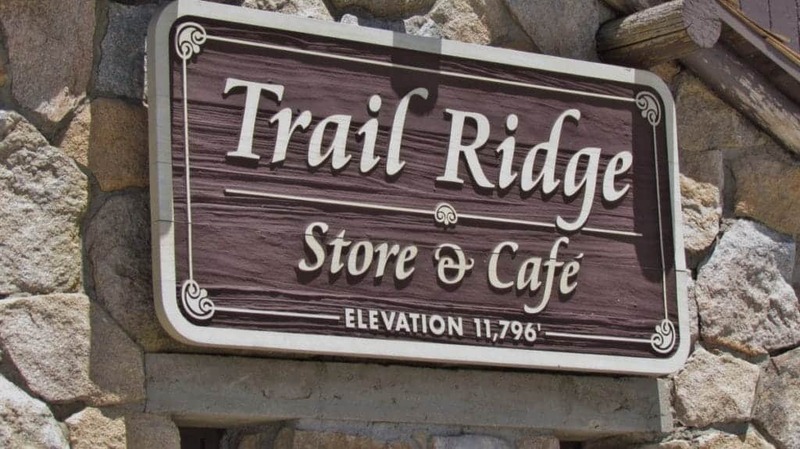 This road includes more than 10 miles of drive above the tree line (about 11,500 feet). This allows travelers a sweeping view of the mountain range surrounding them. 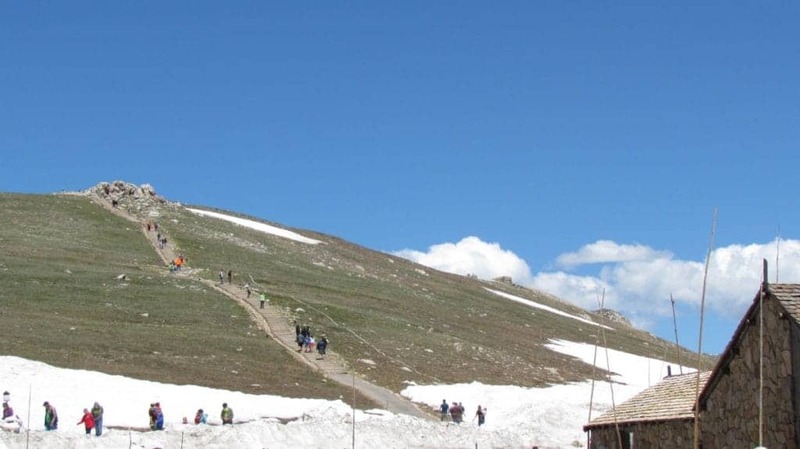 Its highest point peaks at 12,183 feet above sea level, making this the highest road in any national park. 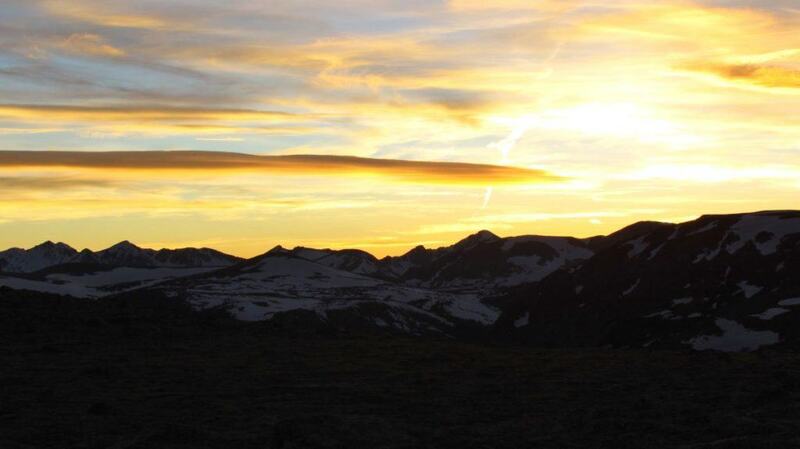 The Trail Ridge Road began as a path used by native Americans to cross between their home lands in the west, and the hunting region to the east. The road was began in the late 1920’s despite much opposition. 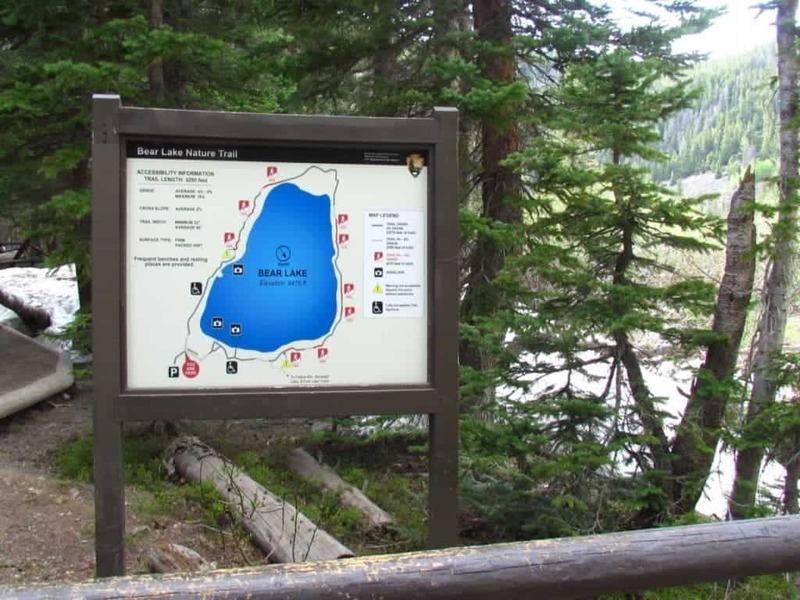 The director of the National Park Service decided that it would encourage visitors, and steps were taken to minimize the intrusion on the landscape. We began our journey on the western end. At the entrance we purchased a 7 day pass for the park for $30.00. If you are just passing through you can get a single day permit for $20.00 per car. 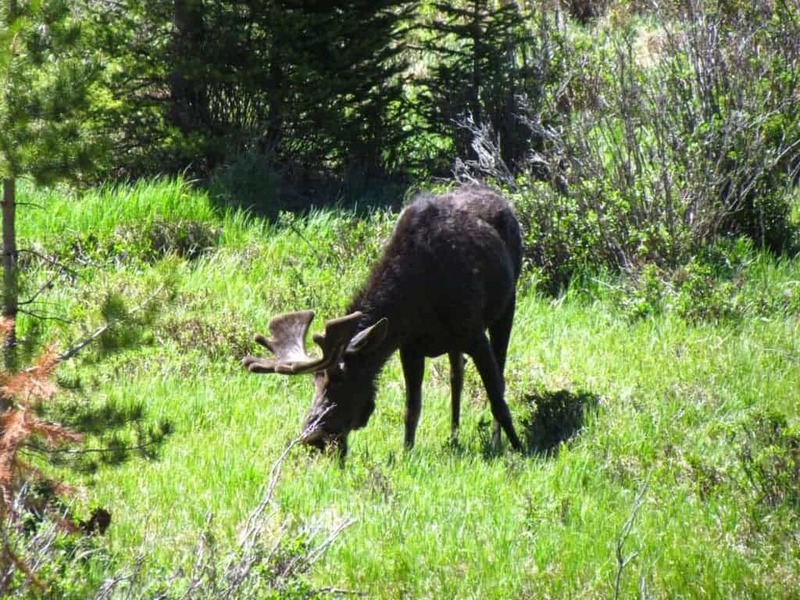 We found ourselves quickly ascending about 4000 feet through aspen forests, and meadows filled with native wildlife. Soon you pass through these and into the fir and spruce filled subalpine forests. 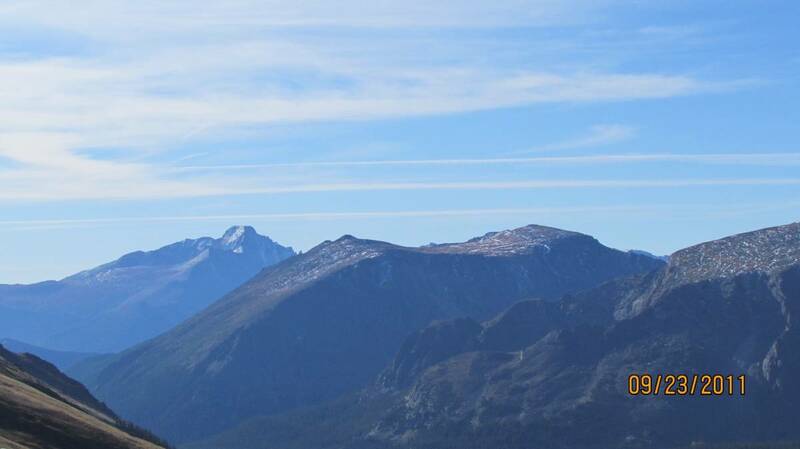 As you continue your ascent, you finally pass beyond the tree line and enter the alpine tundra. In this windswept area few animals reside. Those that do are especially equipped to handle the harsh conditions. 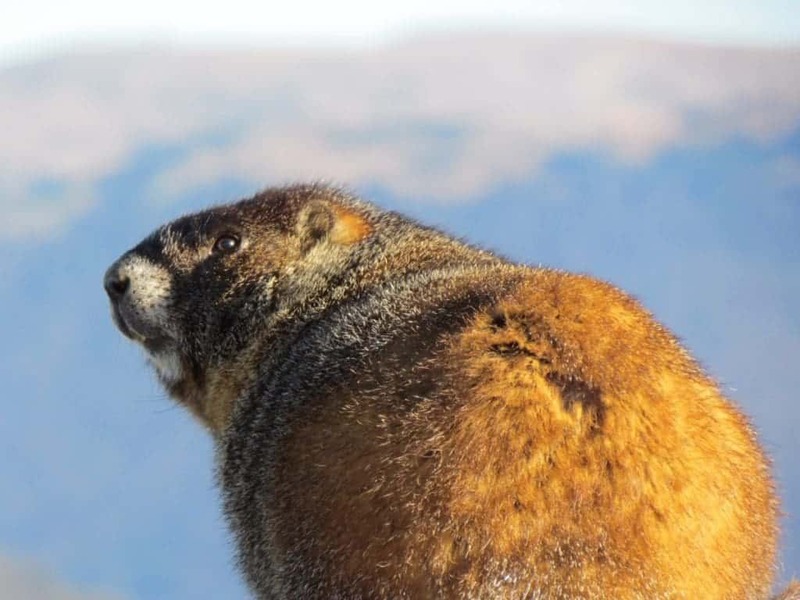 A keen eye will uncover the marmots, Pikas or bighorn sheep that graze cautiously in the open areas. 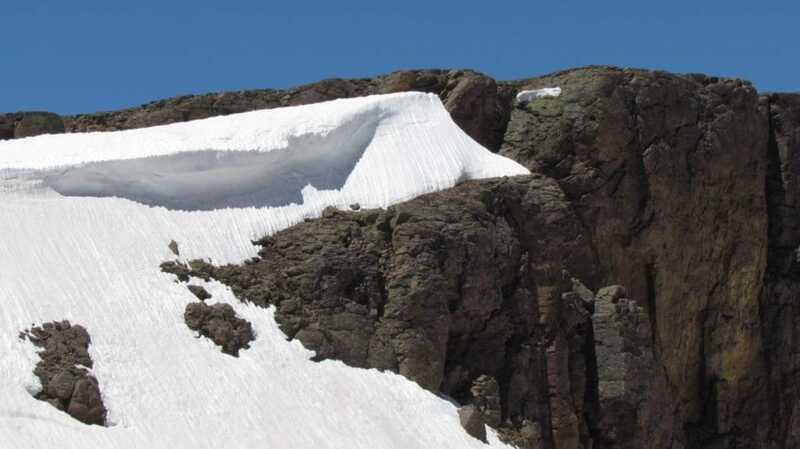 Travelers along the Trail Ridge Road are in for some wonderful views, at this high altitude. There are plenty of pullovers along the way for safe viewing. It is easy to let the time slide away, as every turn offers a new view. 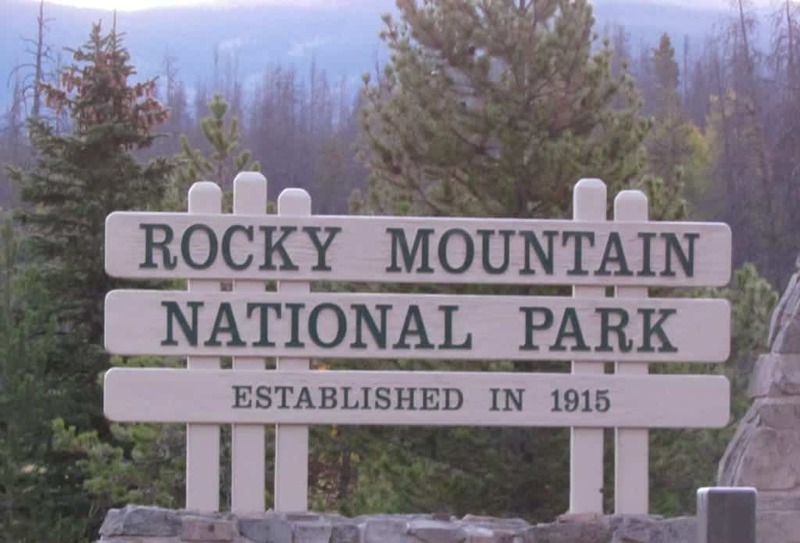 Due to the high altitudes, a large portion of the road closes between mid-October until Memorial Day. If you have plans near either of those dates it would be wise to keep a close eye on the weather conditions. After crossing the Continental Divide at Milner Pass, we were ready to stretch our legs. A little farther up the road we came to the Alpine Visitor Center. Here guests may grab a bite to eat, do some souvenir shopping and use the restroom facilities. Those looking to add a little more altitude can make the climb to the top of the paved trail behind the building. This gives you the chance to feel like you are on top of the world, and possibly a little light headed. Back on the road, we came upon the highest altitude that the road reaches. It would all be downhill from here, albeit a rather slow descent. All along the way we would encounter snow drifts. 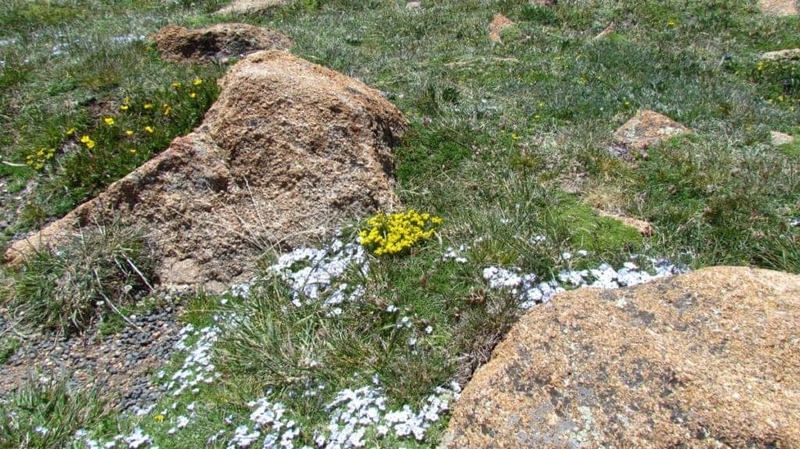 In some places they were still a few feet deep, but amazingly just a few feet away we would find alpine flowers blooming. 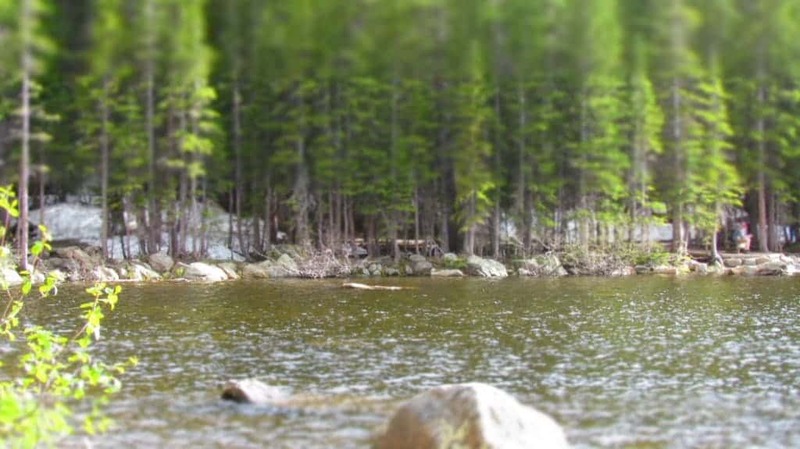 No matter how often this scene repeated itself, we were still amazed at the wonders of nature. As we approached the eastern side of the park, we dropped back below the top of the tree line. Here we began encountering larger animals again. 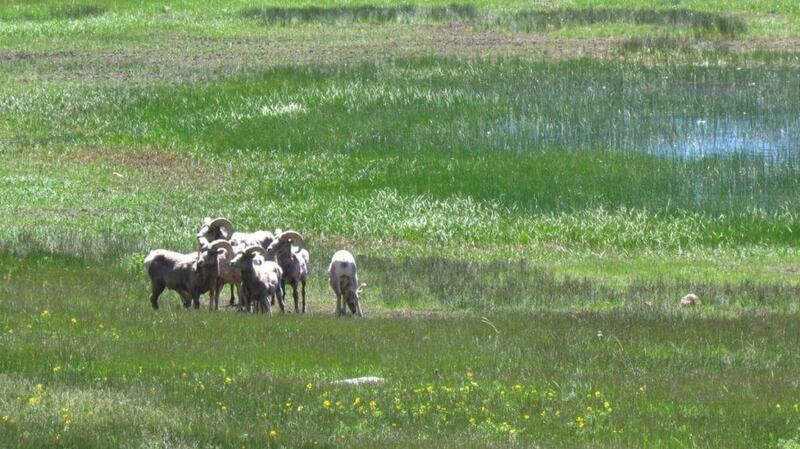 In an area appropriately named Sheep Lakes, we spotted a small group of bighorn sheep grazing in a small meadow. We were approaching the eastern entrance to the park, but had one more detour to take. The road to Moraine Park offers visitors an assortment of scenic trailheads with varying length hikes. We were limited on time, so we chose two hikes that were each 1/2 mile long. The first took us on a circuit around Bear Lake. At just under 10,000 feet altitude it was more of a chore than we expected, but we both completed it without any breaks. 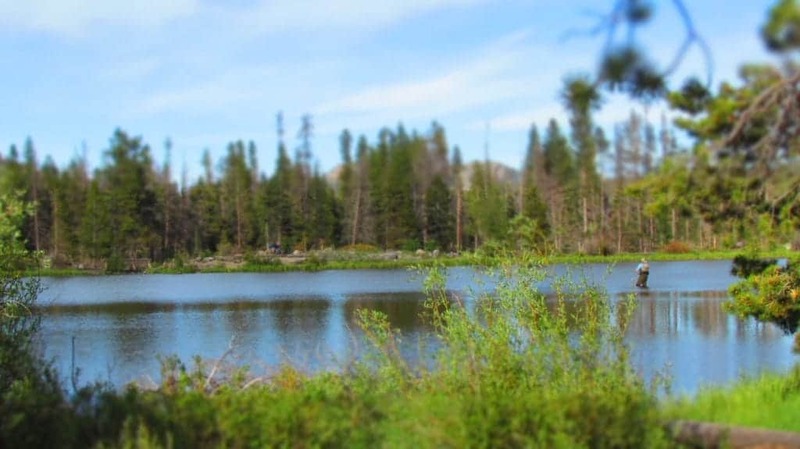 Our second hike was at Sprague Lake, which was popular with a local fisherman. As we marched around the lake, we watched him cast repeatedly, but never saw him catch anything. Soon we were back in the car and heading toward Estes Park. 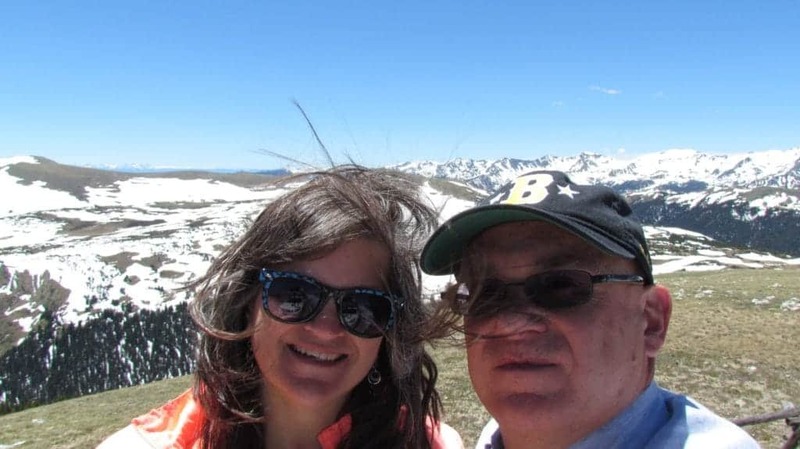 After checking into our hotel, and having a hearty dinner, we slipped back into the park for a sunset drive along Trail Ridge Road. We drove back above the tree line, and found a place to park. We watched the sun pass behind the mountains, and the light slip from the sky. As twilight faded the stars came out, and we sat in awe of the depth and beauty of a clear night sky, beyond the city lights. For those moments we felt like we were the only people on the planet, and that we were on top of the world.